iTunes and App Store users have long been able to gift apps, movies, and music, and thanks to a recent iBooks Store change, we can all give the gift of literature too, and complete the whole transaction right in our hand from iOS. Perhaps best of all, you can schedule the gift arrival to be on a specific date, and the gifted book arrives neatly in their email inbox right on time, which means that even total slacker holiday shoppers like me will be able to get something for everyone in time for Christmas. 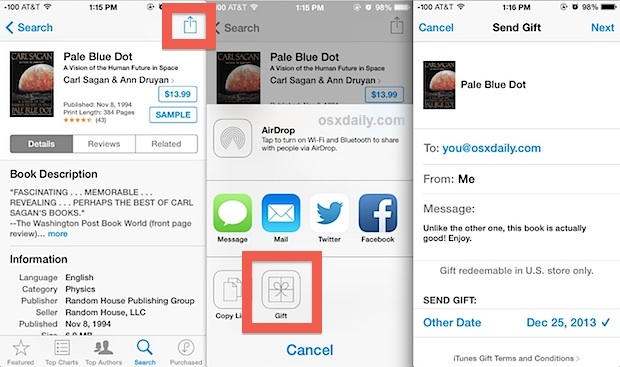 Books sent as gifts are readable by the recipient through the iBooks app, so you’ll want to be sure they have an iPad, iPhone, iPod touch, or Mac to be able to actually read what you sent them. Gifted items are also billed to the senders iTunes account, so keep that in mind if you’re using someone else’s machine to browse around. This works either the iTunes or iBooks apps on the iPhone, iPad, or iPod touch in iOS. A perfect last minute option for those awkward Christmas morning situations where everyone is sitting around the tree and you still haven’t bought anyone presents yet (not me, I swear). Easy, right? Your shopping procrastination is no longer a concern, and the event, birthday, Christmas, Hanukkah, Kwanza, Eid, New Year, wedding, whatever your present exchanging occasion may be, has been saved. On the recipients end, they get a nice email with the theme chosen, they click through to redeem the book gift and add it to their iTunes Account. The whole experience is super easy on both the buying and receiving end, making it practically foolproof and a great option for virtual presents. The gift recipient will need the iBooks app of course, which is a free download for iOS users, and it’s also included free in OS X Mavericks for Mac users. This whole process works basically the same as gifting apps and movies, delivery date scheduling included, but let’s face it, books are generally a better choice for presents for many people, which makes this a very welcome addition to the iTunes and iBook stores. I’d really recommend this to iPad users, reading on the iPhone screen is not too fun. BTW Pale Blue Dot is a great read and excellent gift, so is Cosmos. Two great books, not sure if the digital version includes the wonderful pictures too though.